Iowa ranks 9th for business friendliness. 2nd lowest cost of doing business by CNBC. We earned that by working closely with companies here and understanding what you need. Like when our universities and community colleges align curriculum to provide the skills you need that give you an edge. Like having one of the nation's lowest costs of doing business. Like having a government that balances its budget. Every year. And bends over backwards to help companies succeed. Visit iowaeconomicdevelopment.com to see how we can help you grow your business in Iowa. When it comes to High School graduation rates, Iowa ranks 1st in the U.S. With 14 accredited engineering schools, Iowa colleges and universities annually deliver more than 5,300 graduates to the workforce in science, technology, engineering and mathematics (STEM) fields. Iowa is a national leader in mentoring girls to consider fields in science, technology, engineering and math (STEM). Visit Million Women Mentors™ for more information. Iowa already has more than 1,800 STEM mentors with a goal of 5,000 by 2018. Iowa, which ranks 5th in the nation for job growth and 3rd in the U.S. for job creation, adding more than 11,600 non-farm jobs this past year growing the total state workforce of 1.485 million. Iowa is among the leading states in terms of low unemployment rates, more than 33 percent lower than the national average. Housing costs are the 9th lowest in the nation. 8th in the nation for number of state parks and recreational & natural areas. Utilities (electric) is the lowest of our neighboring states. Iowans get the job done. And one of the lowest commute times in the country gets us home faster. So we can enjoy a day soaking up the sun's rays on a lake. 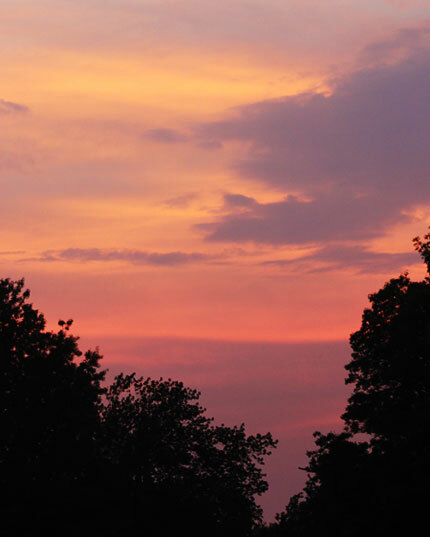 Collect fireflies with our kids in the 7th best state to raise a child. Enjoy the sight of Monarch butterflies as they migrate. Explore over 2,000 miles of bike trails. Catch a concert on the river. Maybe its an Iowan thing, but we believe everyone should get a life. And have the time to enjoy it. A wide variety of job opportunities exist and Shelby County needs good employees to fill them. Follow this link list of major employers or call us to discuss the career you seek. Our mission is to recruit, retain, expand, and attract manufacturing, distribution, and service companies to maintain and improve the quality of life in Shelby County through economic stability. Visit this link to see some of the things we will help you with. 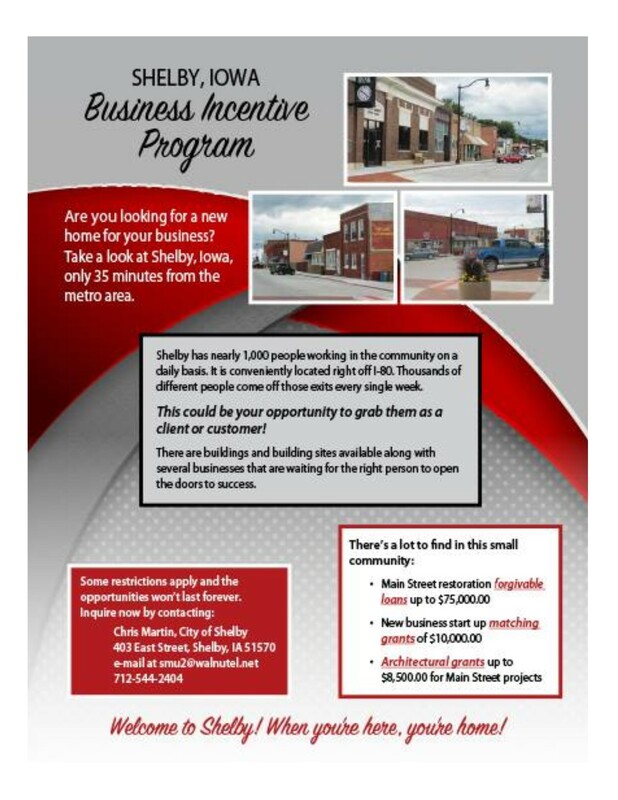 Shelby County and the Shelby community have Shelby County Business Improvement Programs with more to follow suit. 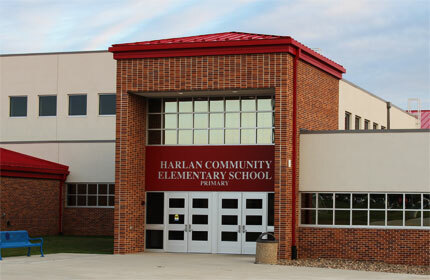 Harlan Community School students annually test in the top percentiles of national scores and have unprecedented success in co-curricular activities with 12 football state championships as well as championships in baseball, basketball, cross country, golf, track, volleyball, and wrestling. Marching Band earned 41 consecutive Division I ratings and the Jazz Band won state five times. FHA continually earns top scores. The outstanding facilities were capped off with a $12 million primary school in 2008. Exira-EHK Community School and Shelby County Catholic School also provide excellent educational opportunities. Iowa Western Community College constructed an 8,000 sq. ft attendance center in Harlan, which is equipped with the newest technology and lab equipment. A new Harlan housing development is the site for a $4.2 million, 27 unit workforce housing project. There is ample rental and owner-occupied housing across the county. Harlan and Shelby County offer high-speed cable and fiber internet. The utility companies continue to upgrade infrastructure for excellent utility services. Over 1,770 acres of parks and trails, 400 acres of public access hunting, wide range of athletic facilities, a new Wellness Center, two nine-hole golf courses, bowling alley, movie theatre, museums, and ethnic celebrations. If Shelby County doesn’t have it, we are located within an easy drive of two metro areas. Myrtue Medical Center's nine doctors and 21 specialty clinics provide a full range of services. A $16.3 million expansion is underway for surgery, outpatient clinics, lab, radiology, and its birthing center. The community combined resources to construct a 44,000 sq. ft. Wellness Center that features fitness, basketball, racquetball, aquatic, and physical therapy centers. A 2011 report by the University of Wisconsin Population Health Institute identified Shelby County as one of Iowa's healthiest counties.